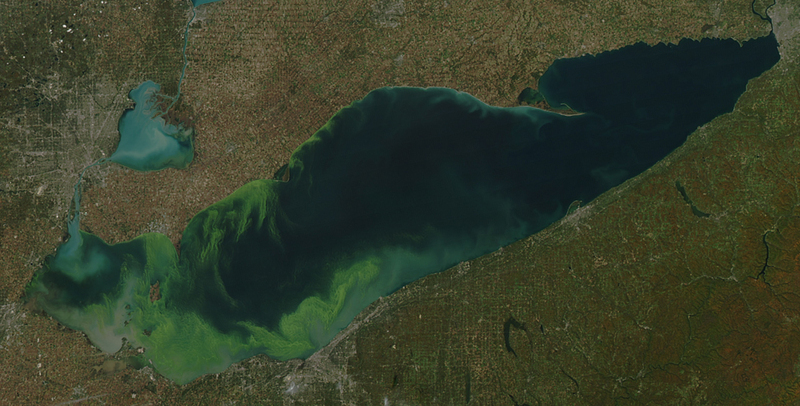 Vast, toxic seasonal algal blooms may become commonplace on Lake Erie if agricultural practices don’t change soon, according to a recent study on the causes of a 2011 record breaking algal bloom. The good news is there is a calculated threshold for nutrient runoff that, if met, should reduce the likelihood for more blooms. If farmers, citizens and waste water treatment facilities can collectively reduce their runoff to 1,000 metric tons or less phosphorus, large harmful algal blooms should be much less prevalent. “To meet that target the people on the land have to do their part, whether it’s changing agricultural practices, sewage treatment upgrades or how they fertilize their own lawns,” said Justin Chaffin, research coordinator at the Ohio State University’s Stone Laboratory and contributor to the study. Shallow phosphorus deposition in soil, heavy spring rains and stagnant summer weather brought the 2011 bloom to life. It flourished, by October covering 5,000 square kilometers, or an area three times the size of the previous record. The algae’s main source of food came from the Maumee Bay, near Toledo. Phosphorus washed into the lake mostly from large agricultural operations pushing to deliver soybeans and corn to market. Sewage overflows and home yard fertilizer also contributed to the nutrient loading. Chaffin said calm hot summer weather didn’t help the situation. “All that spring (season) water that had phosphorus entered the Maumee Bay and just sat there,” he said. With more than 2,000 metric tons of phosphorus in the mix and little wind to disturb algae floating on the surface, the lake became an incubator for cyanobacteria. Residents on shore soon saw the results. A 10-centimeter-thick fluorescent green scum covered much of the lake’s western basin. The larger problem, the study authors found, is that a bloom of this scale will likely happen again. Nationally, the study reports, corn production increased by 11 percent from 2008 to 2011. Corn requires more nutrients than soybeans for good yields, which may have contributed to the record bloom. The study authors cited fertilizing practices as the larger culprit for a 218 percent increase in nutrient loading through Maumee Bay seen from 1995 through 2011. It’s common to fertilize only a field’s top layer without tilling it into deeper into the soil. The method saves time and effort for farmers, but it also leads to much easier runoff of nutrients. Weather monitoring from buoy stations on the lake and satellite observations showed conditions were ideal for the bloom. Powerful rain storms washed nutrients into the bay, strong winds stratified the water and calm conditions incubated microcystis. According to study authors, these conditions are not unusual on the lake. Despite bleak predictions, Chaffin said the problem is fixable. In the 1960s and 1970s, harmful algal blooms were a big problem in Lake Erie. “The problem was the same, but the source of phosphorus was different,” Chaffin said. The biggest contributor was raw sewage running into the lake and feeding algae. Municipalities worked to improve water treatment, which reduced the preponderance of blooms. Chaffin said if farmers and citizens can work to mitigate fertilizer runoff, they can solve the new algal bloom issue in Lake Erie. During 2011, the lake took in 2,400 metric tons of phosphorus, more than double the threshold goal. Chaffin said that number shouldn’t dissuade people. “If you look at the average over the past five or six years, (the threshold is) only a 35 percent reduction in phosphorus loading,” he said. Several representatives of Ohio’s agricultural industry stated that reducing nutrient runoff to improve water quality was important to them in comments to Ohio Governor John Kasich’s proposed regulation of nutrient application. Harmful algal blooms produce toxic microcystin, which can kill wildlife and even poison people that drink or contact the water. The study was published in the Proceedings of the National Academy of Sciences in April. Its two-dozen authors come from a mix of universities, government and industry.